What? What?! My new half PR: 1:44:38 (avg. 7:59/mile) is over 8 minutes better than my last PR! Dominic asked me before the race how I thought I’d do and what time I was aiming for. Given I was coming off of two injuries (my nagging shin splint in my right leg and a pulled calf muscle in my left), I told him I just wanted to run the best that I could and just keep it relaxed with no time in mind. In my last run, I was able to accelerate about half way through an 11 mile run and was feeling good, so I knew I had the potential to at least near my 1:52 best so far in a half, but I didn’t want to stress myself out since the last time I aimed for a specific time (sub 4 hours at the LA Marathon), things didn’t work out. The conditions in Windsor were perfect for the race. When the gun went off, I tried to find a good spot in the crowd to let the excitement pass. I checked my watch and saw I was running around an 8:04/mile, which was too fast, so I eased my pace a bit and told myself that if I reached mile 5 or 6 and still felt good, I could punch it up a notch. Around mile 4, I was grouped with two older male runners who both looked strong. We had a good clip going and were passing up some of the younger runners around us. This portion of the race was a bit hilly and I noticed one of the men kept passing me on the uphill, while I passed him on the downhill. After the 4th hill, he transitioned to a walk. I patted him on the shoulder to encourage him to keep going, and he smiled and gave me the thumbs up as I passed him. I never saw him again. I stayed focused. Breathing steadily. Letting my arms tell my legs to keep up the cadence. I didn’t slow much on the uphills but kept up a steady pace. It was incredibly gratifying to see runners ahead of me, knowing I could eventually pass them. The mile 6 marker came and went and I turned it up a notch. I was passing lots of people for the next few miles. When I got to mile 9, I was starting to fatigue. I wondered how long I could keep up this pace (I had Nike+ calling out the mile markers and my speed in my headphones and knew I was hovering between 7:40 and 8:30 pace). At mile 10, I saw an older lady in front. I wanted to pick her off, knowing she might be competition in my age group. I passed her, but then she stayed on my tail. Ugh! Go away! Let me beat you! It took a while, but I shook her off. When I was at Mile 11, I was really huffing and puffing and the competition wasn’t letting up. I didn’t pass so many people anymore. In fact, another lady that I thought was older than me passed me as I picked up a drink at the water station. Dang! I only took a tiny sip and tried to catch her but she was flying. Mile 12 was hard. 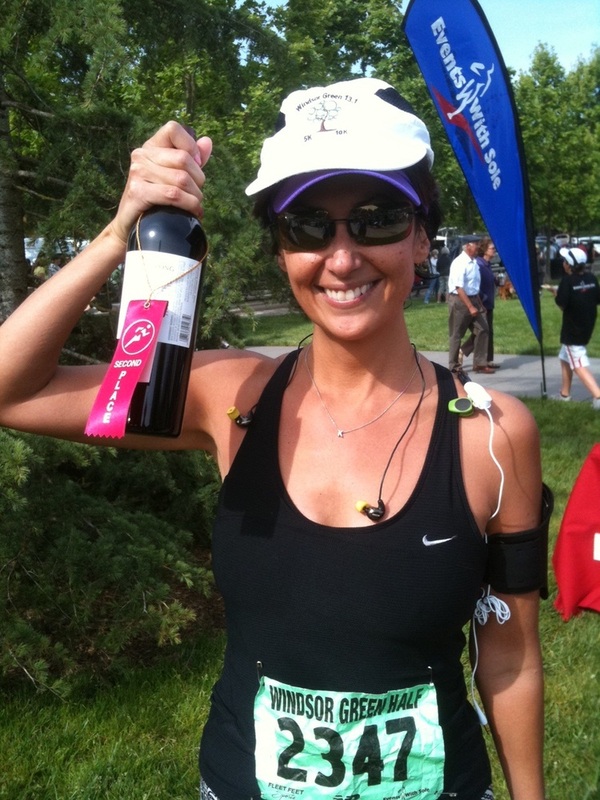 I decided to skip any more water stations as I knew that trying to drink was slowing me down. A guy was running right in front of me and kept checking his watch every 20 seconds. I knew he was hurting. So was I. But the end was nearing and I couldn’t stop now. I looked at my watch – half a mile to go! I could hear my spinning coach Andy’s voice in my head – “You only have 4 minutes left and then you’re done. You can do it!” Yes, yes, only 4 minutes. I can survive it! As we turned the corner to the finish, I accelerated, but I started a bit too soon for my lungs and legs, as both were searing with pain. I thought I was going to lose my breakfast as we entered the final stretches and the crowd closed in. Heaving for air, I tried to step it up for one final push. I didn’t know what my time would be, but I figured it would be okay. I sprinted those last couple of seconds, which felt like hours. And then, the finish line. I turned off my watch and couldn’t believe what it said. 1 hour and 44 minutes. Fully 8 minutes faster than my previous personal best. Really?! How could I be so much faster?! Dominic greeted me and I was so proud to see him carrying a bottle of wine with a blue 1st place ribbon on it for taking the first spot in his age group. I wondered how I did and when I learned I came in 2nd, I was thrilled!! I never thought I’d be able to break a sub-1:45 half, but I did it! Now, if I could only reach that sub-4 hour marathon…. I’m not stopping until I do! (Guess I won’t stop then either, but I really really want to reach that goal).